Keeping your refrigerator running smoothly will extend it's life and help it run more efficiently. Refrigerator maintenance and repair can get expensive though. 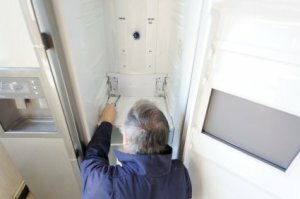 This is a guide about money saving refrigerator tips. Now the weather is turning cold, I leave clean plastic gallon jugs of drinking water outside overnight to freeze. One bottle gives me refreshing iced water in the morning, the others go in the fridge and freezer to fill space and keep cooling costs down. This is especially useful now the furnace is running more often. I just had the refrigerator repair man out to look at my side by side refrigerator. I thought the evaporator fan wasn't working and my service contract is going to expire next month. He gave me several tips while he was here, which I would like to pass on. First, when I told him I did not plan to renew a service contact, he explained to me the reasons I should renew it. Almost any problem that occurs today with a refrigerator has a cost to the consumer of over $200.00, that being the low end cost. Appliances have more plastic and electronic parts and are more apt to need service than the appliances made five to ten years ago. Secondly, he advised me to dump the ice in the ice maker when it gets low, and completely rinse the ice container out top and bottom, otherwise frost builds up in the bottom of the ice maker. Mine had lots of build up! The third and last tip he shared, was to not put any items on the freezer shelves that extend past the shelf, this causes the freezer door not to seal tight, thus costing me more in electricity and makes the refrigerator work harder to cool items. One last thing, he said not to put large wine boxes on the top shelf of the refrigerator, as they block the air flow, due to the height of the wine box. Line the drawers of your refrigerator with paper towels to absorb moisture, your fruits and veggies will stay fresher and it makes for easier cleanup of your drawers.